Found an unusual £2, £1 or 50p coin in your pocket change? Over the past few months we have been receiving a large number of calls from members of the public who have been finding unusual £2, £1 or 50p coins in their pocket change. A variety have been mentioned ranging from the £2 2011 King James Bible to the 50p 2016 Peter Rabbit. Just as an example, a member of the public I spoke to recently had read in the newspaper that the 2011 WWF 50p was worth significantly more that its face value of 50p. The lady had found said coin in her purse and was asking me how much it was worth. What the newspaper didn’t mention was that there were 3,400,000 of these coins struck and in circulation. The old adage of ‘the more of something there is, the less it's worth’ unfortunately rings true in this case. The perhaps disappointing answer to the lady’s question was that we would value her coin as being worth its face value of 50p. The confusion in the media tends to stem from the mintage rate of the different coins. It is important to remember that just because the 2015 £2 Magna Carta with 1,495,000 produced has a lesser mintage rate than the 2014 £2 WWI Outbreak with 5,720,000 produced, does not mean that it is scarcer. 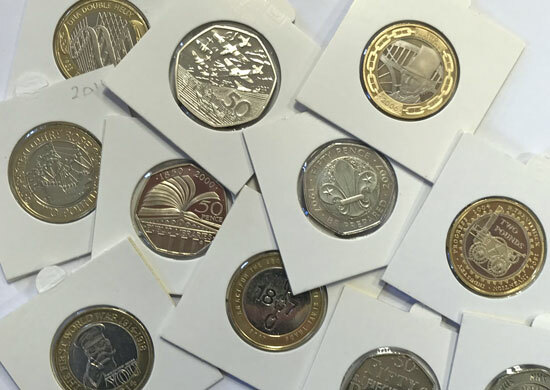 There are after all, almost a million and half of the 2015 £2 still out there, which means a million and a half chances for coin collectors to get their hands on them. As a result of the media’s interest, there has been a significant increase in the amount of these coins listed on websites such as eBay. It is important to remember however that anyone can list something on eBay for whatever price they wish. Whether they will actually sell for these prices is another matter. Because we generally sell to collectors who know the true worth of these coins due to the reasons above, it would unfortunately be difficult to achieve much more than the face value for them at auction. After you take into consideration our commission fee of 17.5% of the hammer price it is often not in the best interest of the customer to sell these coins in one of our specialist auctions. While these coins are interesting and fun to collect, the disappointing truth I’m afraid is that it is extremely unlikely that a coin you have found in your pocket change is an investment for the future.